This week was much better for weather once that big storm system pushed through on Sunday. There were some beauty days on the water mid week and we were happy to be out personal fishing as well as on charters. The harbour has been pretty darn good for a few weeks now with fish off W. Van shoreline in 90-120 feet of water, the Mile Markers and Bell Buoy in 90-130 feet of water and the Freighters in 120-140 feet of water. The usual tactic of keeping your gear just off bottom and covering water has produced some chinook from just legal size all the way up to the high teens! Howe Sound continues to produce similar sized fish from just legal size up to the high teens. There are lots of undersize in the mix as well, so that is encouraging for the future. Crabbing has been decent in the harbour. It’s usually a little better this time of year, so we will see how things progress as we get closer to April. 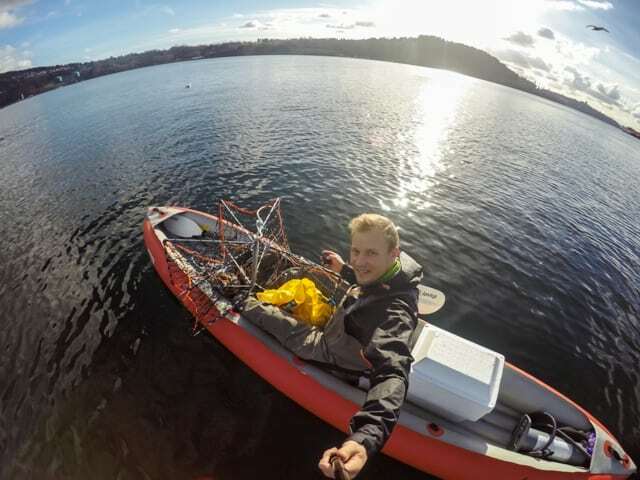 If yoou missed it check out the feature Lars put together on crabbing. Hot flashers have been the Oki’ Chartreuse Glow, and Green Onion Glow. Hot spoons have been the 3.5 Irish Cream, Homeland Security and Kitchen Sink. Hot Pesca spoons have been the 3.5 Gut Bomb and Leprechaun. Bait has also been producing as good or better than spoons. Anchovies in a green glow teaser head has been hard to beat. We have been using 5 to 6 foot leaders with our spoons and bait. The Hump fishery is just around the corner. Last year it picked up a little earlier than normal, around April 10th. By April 15th it was in in full swing. Spring sure seems to be making a push to be early this year. Perhaps this will give us an early start to the Hump again this year. 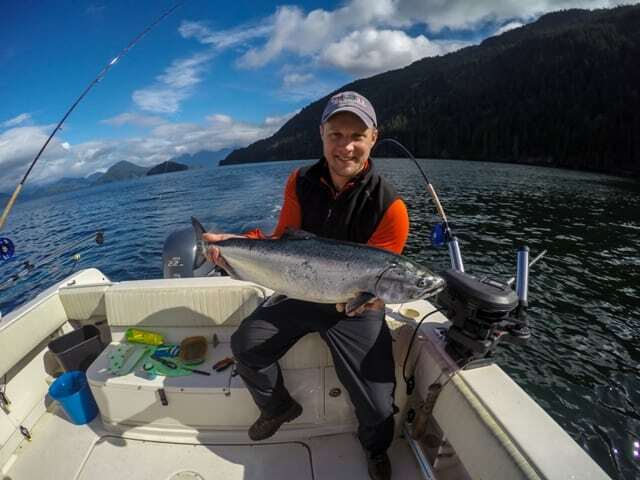 Lars from Pacific Angler with a nice chinook taken from Howe Sound last Saturday. 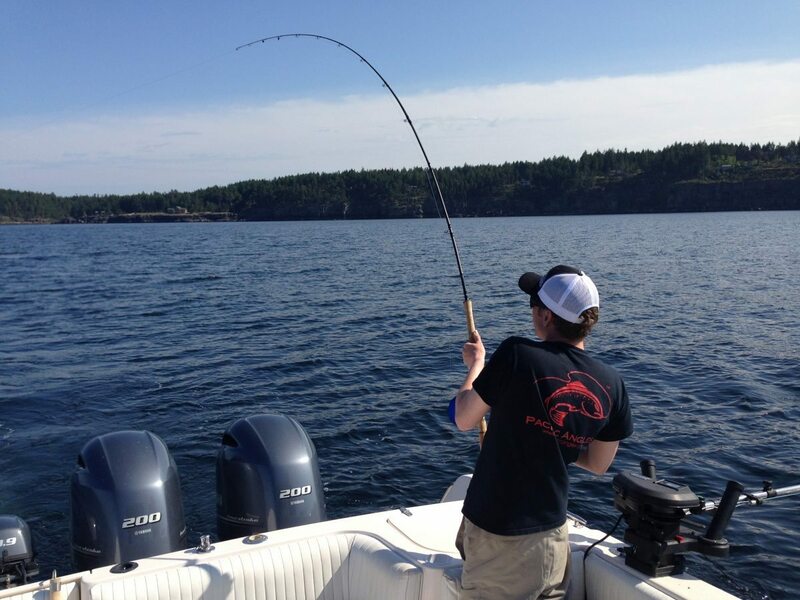 Fishing is good so give him a call at 778-788-8582 to book a trip! With the nice weather we also decided to do something different this week. 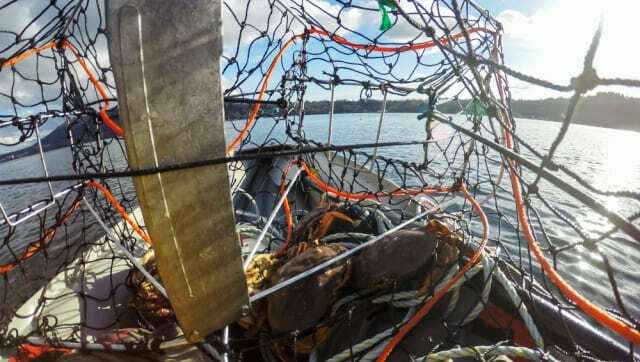 Crabbing around Vancouver is one of the most productive ways to enjoy a feast courtesy of mother nature and late winter is considered one of the best time to do it. With this in mind Lars has been out with his kayak a bunch of times over the last 2 months scouting some very easy local locations. It took him a couple trips to get dialed in but he is now consistently bringing home dinner. He has shared what he has learned in the following report. If you have had trouble getting crabs in the past read his report you might pick up some tricks that will change your luck. Crabbing has been good the last few weeks, and is picking up. Come visit the shop for all your gear. We have multiple types of traps. 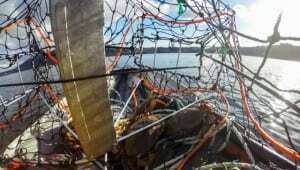 We have the classic grid-style metal traps which are great on the boats and we also have a steel enforced mesh trap that is great if you are crabbing from a SUP or Kayak. The mesh version also packs down really small for storage. For line, we recommend 100 feet. I have been using leaded line and like it but you could use a line weight if you already have un-leaded rope to keep the line close to the bottom. Weighted line or lead line is critical to keep the line from floating and making sure no one runs over your line and drags your trap. For bait, there are many options. I experimented with a few types and have settled on salmon heads as my favorite. If you have these they are great. Make sure to take them out of the fridge a few days in advance to get them a bit “soft”. We don’t want rotting bait but you do not want frozen bait and if it is a few days old it smells more. Crabs love this. If you don’t have salmon heads, supermarkets, primarily the Asian style smaller markets have them, and you can usually get them for $2-4 dollars for a bag of 3-4 heads (depending on the size) I sometimes mix in a bit of chicken back with the salmon head and if you can’t get salmon heads, chicken back will work well. Use a large mesh bait bag so that the crabs can enter the pot, and actually sit down and play with the bait, this will keep them busy and inside the pot. I made mistakes at first with using bait that the crabs couldn’t really pick at. This is one of the biggest mistakes we see. The crabs will leave the trap when other crabs open the door to come in (revolving door problem). Putting the bait on the bottom of the trap not the top seemed to help with this as well. Also make sure the bait is well anchored to the bottom so it stays center. 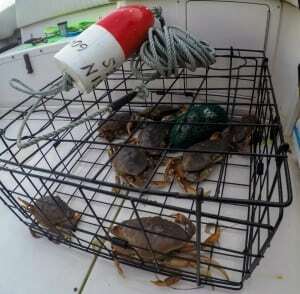 Centered bait will allow more room for more crabs to get into the trap and keeps them away from the doors. Anchor it well so the crabs can’t pull it towards one of the doors and make it easier for them to escape when their buddies open the door from the outside. You can catch crabs at almost any depth but I have found that my best sets were between 50 and 60 feet. Though many guys will set their traps in rocky areas I found my best sets of the last couple months were on flat sandy bottoms. Regardless if your are fishing from a boat, or smaller craft like a kayak or SUP, there are multiple great spots locally. To name a few, Spanish banks has fished well, and so have 2nd and 3rd beach, all three spots are great if you are launching a kayak. Ginger and scallion crab with noodle – FEAST! It’s a great time to go now since the commercial crabbing season haven’t stared it, the crabs are plentiful and very tasty. 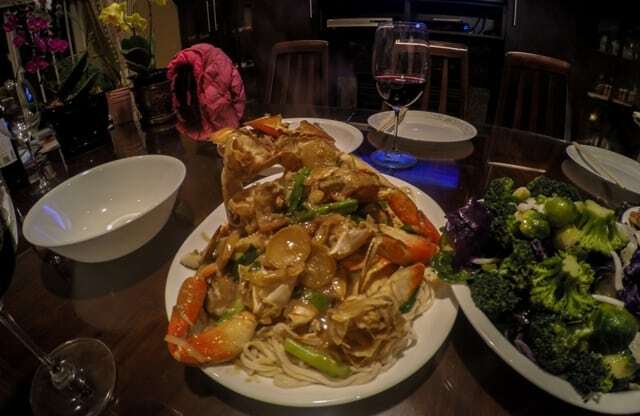 My favorite recipe so far is the Cantonese “ginger and scallion crab with noodles” recipe. This is simply amazing. Link to recipe http://en.christinesrecipes.com/2013/06/ginger-scallion-crab-noodles.html.